This premium raspberry gin brand raised £1m from the crowd to capitalise on the global gin renaissance. ‘Bottom’s up’ for People’s Champion? A frustrated accountant, a kitchen table and a bottle of gin – these are the three factors that helped make Pinkster Gin a reality. After being told by his doctor to stop drinking wine, founder Stephen Marsh turned his attention to spirits and began experimenting at home; mashing fruits with different spirit strengths. After hitting upon a winning gin formula, he quit his job to focus on the business proper. Three years on and Marsh’s premium gin brand is expanding steadily. Produced with fresh British raspberries and other botanicals, Pinkster Gin’s distinctive colour and flavour has seen it attract listings with leading UK wholesalers including Gordon and MacPhail, over 500 outlets including Majestic Wines and Oddbins, alongside bars such as Hyatt Regency Hotel and assorted Rick Stein operations. While gin beverages are the focus of the business – and a market which is booming (as reported by Startups.co.uk)– the company also produces ‘Boozy Berries’; jars of left-over “inebriated” raspberries which can be used in ice creams or dipped in chocolate. 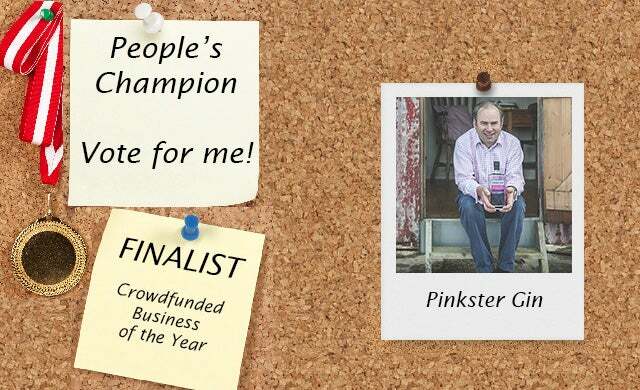 Focused on bringing about a “raspberry revolution”, earlier this year Pinkster Gin raised £1m in a crowdfunding round via Growthdeck – smashing its initial £600,000 target in just six weeks. Having already launched Pinkster Gin in overseas markets such as Australia, the USA, and Ireland, this funding will go towards financing the start-up’s ambitious growth plans with Germany next on the agenda. The premium gin category is highly competitive with over 250 gin brands vying for customer sales and yet Pinkster Gin – unique in colour, flavour and branding –is carving out a future in the gin market. This potential for growth has been recognised by its overfunded £1m crowdfunding round. As for a raspberry revolution? We can certainly drink to that!